Spine-dedicated segmentation, image fusion and volumetric outlining. Streamlined workflow to transform management of spinal lesions with Elements Spine SRS. Monitoring for intrafractional motion control with ExacTrac®. The need for accuracy and indication-specific solutions becomes a challenge in spine SRS due to the location of the complex target next to the spinal cord as well as the curvature of the spine. 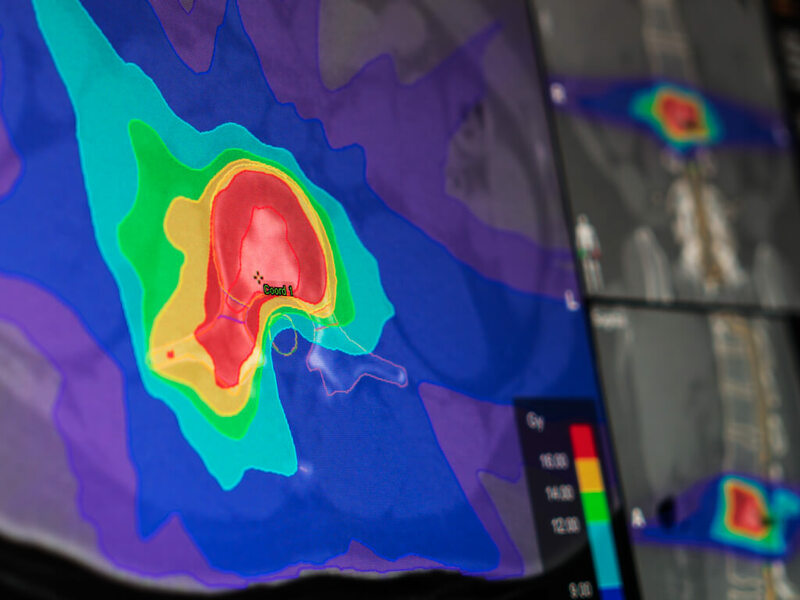 To tackle this, Brainlab has developed Elements Spine SRS, which offers clinical efficiency for both treatment planning and delivery and addresses many of the current challenges in spine radiosurgery. 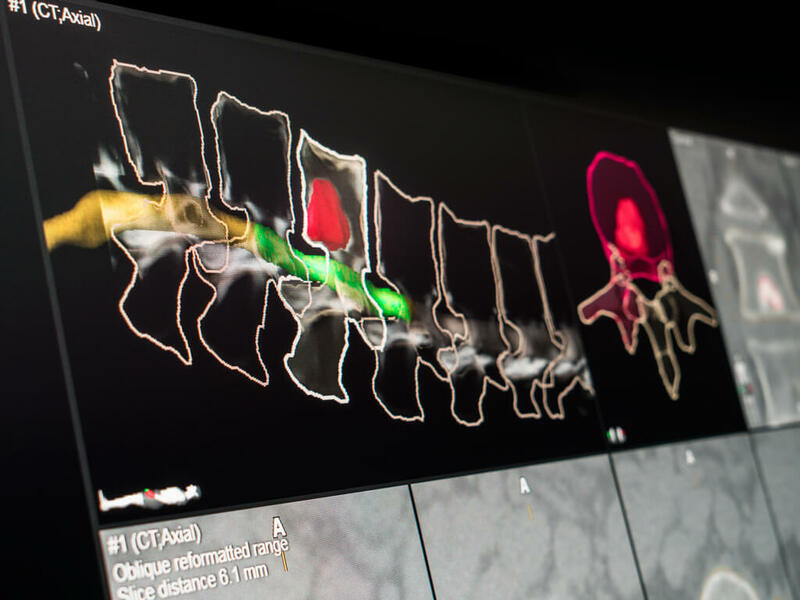 The Spine SRS workflow begins with the automatic definition of organs at risk (OAR) with Elements Segmentation Spine based on our Synthetic Tissue Model. This provides the necessary basis for multi rigid fusion of MR-CT or CT-CT scans with Elements Spine Curvature Correction, meaning that a rigid fusion is applied to the vertebrae themselves and an elastic deformation to the soft tissue around the vertebrae. Accounting for the different spine curvatures facilitates the outlining of the Gross Tumor Volume (GTV), allowing for consistent, accurate and automated Clinical Target Volume (CTV) definition performed by Elements SmartBrush Spine. 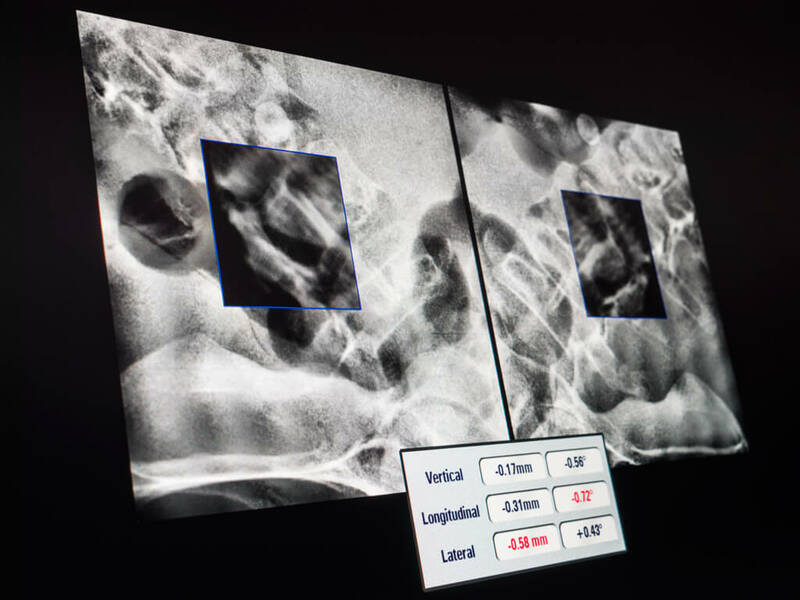 Finally, to achieve excellent dose planning and metrics and a highly conformal dose for spine, an algorithm of the new Elements Spine SRS internally breaks down planning target volumes into a number of smaller targets. Consequently, the dose to the spinal cord can be minimized and, in doing so, potentially improve patient outcomes. Improved clinical efficiency with Elements Spine SRS through highly automated workflows helps clinicians to offer immediate and quick therapy for patients with severe spine pain.